The PodcastBus is an unconventional bus ride that’s part conference session, part networking event and part sightseeing tour. Onboard the bus, shortly after departing, we host an engaging discussion featuring noted leaders and experts across various business and technology. In most cases, you won’t be able to see the actual interview taking place due to the configuration of the vehicle used. As an attendee, you’ll listen to our conversation as it happens through the bus speakers, which act as our version of a live podcast. As we travel to our destination through the city, you’ll gain knowledge and perspective enroute. Each PodcastBus event will end at a food hall, restaurant or “foodie” neighborhood. After the podcast interview and live recording session are complete, attendees will be grouped into small breakout pods of 4-6 people. Groups are generally curated according to interest and or need. It’s here where you’ll be able to connect with your fellow attendees and our featured speaker in a fun, casual and meaningful way. 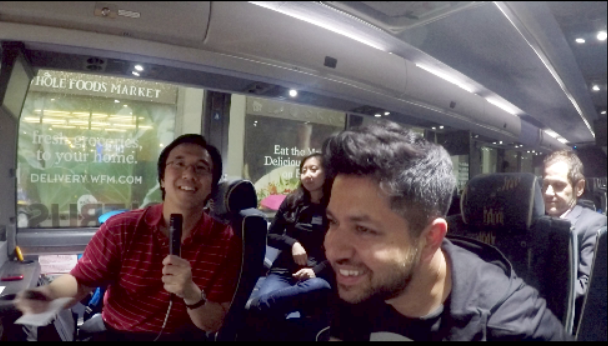 The first video of our PodcastBus series, recorded on a moving BoltBus travelling along the streets of Manhattan. Our good friend Pavan Bahl of Mouthmedia Network joins our live podcast bus to explain how he and his partners launched their media network of B2B lifestyle podcasts, including Fashion is Your Business. He shares with us the lessons they learned from their initial experience and the factors that are driving content strategy for brands today and in the future. The second video from our PodcastBus community & event series, recorded on a moving BoltBus travelling along the streets of Manhattan. Our good friend Sumeet Shah, currently the VC in Residence at Galvanize NYC joins our live podcast bus to share the inner workings of why startups and brands should embrace community and how each party ultimately benefits from a symbiotic relationship. Stay tuned for our upcoming PodcastBus events this Fall in NYC! The PodcastBus is also available for private groups, including brands, conferences and other organizations looking to activate their audiences through unique travel experiences and engaging content. For more information, please complete the form below and we’ll help you make your PodcastBus vision a reality!